3.1 America: Hated for What it is or for What it Does? 3.2 A Clash of Civilizations? 4.1 The Arab/Islamic World During the Colonial Period. 4.3 US Foreign Policy in the Arab World. 4.5 The Phenomenon of the “Mu’amarah” in the Arab World. 5.4 Opposition to the Saudi Royal Family. The Arabian Peninsula has never-since God made it flat, created its desert, and encircled it with seas-been stormed by any forces like the Crusader armies spreading in it like locusts, eating its riches and wiping out its plantations. […] For seven years the United States has been occupying the lands of Islam in the holiest of places, the Arabian Peninsula, plundering its riches, dictating to its rulers, humiliating its people, terrorizing its neighbors, and turning its bases in the peninsula into a spearhead through which to fight the neighboring Muslim peoples. After Saddam Hussein invaded Kuwait in 1990, the Saudi royal family was worried that Saddam would not stop in Kuwait but march with his armies into Saudi Arabia next. Therefore, the Saudis were looking for protection from Saddam, especially protection for the holy sites of Mecca and Medina. Bin Ladin, having just defeated the Soviet army in Afghanistan, believed it was God’s will that his holy warriors defend the most sacred of all places of Islam. He went to the Saudi royals and suggested, even pleaded that he defend the holy sites from the tyranny of Saddam Hussein but he was rejected. Not only that, but the Saudi royal family decided to let American forces come into the country to protect the holy sites against Saddam. Of all the solutions, to Bin Ladin, this was the worst case scenario. He had to stand by while non-Muslim forces, infidels, were protecting Saudi Arabia and most importantly Mecca and Medina. Bin Ladin was furious at and disappointed with the Saudi royals. How could they call themselves “guardians of the holy sites” and then turn around and disregard every “Islamic principle” with letting non-Muslims into the country and near Mecca and Medina? The discourse on al Qaida or Bin Ladin in particular seems to suggest the stationing of American troops on Saudi soil radicalized dissenters such as Bin Ladin and their anti-American sentiments. As Rohan Gunaratna argues in his book Inside Al Qaeda, “For Osama, the US presence in Saudi Arabia remained the issue of primary importance, as was clearly reflected when Al Qaeda planned, prepared and executed its first major successful operation against the US [the simultaneous bombing of the two embassies in East Africa on August 7, 1998, which was the eighth anniversary of the arrival of American troops in Saudi Arabia in 1990].” Furthermore, Gunaratna depicts an angry Osama Bin Ladin, who “was embittered [because] there was no sign of the Americans withdrawing their troops from the Arabian Peninsula.” These types of findings prompted a look back at the events of the Gulf War of 1990/1991 and the question on the significance of the Gulf War and the presence of US troops on Saudi soil for the cultivation of Arab/Islamic anti-Americanism in the region. This is the question intended to be answered in this analysis. In order to achieve that the sources and method applied to investigate them will be elaborated upon in the next section. An attempt to identify sources of anti-Americanism can only be accomplished when a definition of anti-Americanism is provided. The difficulties that arise from this process as well as a workable definition will be introduced in section three. Afterwards, a review of the academic discourse on anti-Americanism in the Arab/Islamic World is presented which serves to reveal its major themes. Chapter four is intended to give historical background information which is vital for the comprehension and contextualization of the discourse on Arab/Islamic anti-Americanism and the analysis of the sources in chapter five. In the main analytical chapter five, a hermeneutical approach is utilized to examine Arabic newspapers, manifests and speeches during the first months of the Gulf War of 1990 in an effort to localize anti-American sentiments or other reoccurring themes that may be of particular significance. Special attention is paid to the two letters sent to the King of Saudi Arabia, one by numerous Saudi Islamists and the other by Osama Bin Ladin five years later. The letters will be compared and contrasted in an effort to further illuminate potential signs of anti-Americanism. Section six will then compare the detected themes in the Arabic sources with the self-evaluation undergone by the White House and the United States Senate and its Foreign Relations Committee in an effort to identify sources of anti-Americanism in the Arab/Islamic World. This comparison serves to underline differences and similarities in evaluation and perception that exist on both sides which might further explain the origins of tension between the United States and Arab countries. In order to successfully answer my research question a definition of anti-Americanism that is being applied to the acquired data will be introduced. This definition enables the identification of sources of Arab/Islamic anti-Americanism. Before discussing the problem of defining anti-Americanism and the eventual definition applied here, the sources used in this analysis have to be pointed out. The problem of Arab/Islamic anti-Americanism is being investigated from both sides of the aisle. As Arabic sources, the focus will mainly be on two Arabic newspapers, a Jordanian paper called al-Dustur and an Egyptian one called al-Ahram. The Jordanian newspaper represents the pro-Iraqi, radical Islamist viewpoint critical of Saudi Arabia, being a voice of Islamist hardliners and a group called the Jordanian Muslim Brotherhood. The Egyptian newspaper represents the anti-Iraqi coalition, being state-controlled and therefore less radical and less critical towards Saudi Arabia. Additionally, whenever it becomes relevant, letters, manifests or speeches by individual dissident leaders will be included to underline a particular point or to provide examples of a certain sentiment. The sources presented here were usually analyzed with a hermeneutical approach. Due to space constraints and prioritization however, not every source was evaluated with a complete source criticism. It was only provided when background information of the source and details regarding the author of the text further underlined the point discussed. Generally, a qualitative analysis was conducted to examine and contextualize the sources. The newspaper articles were examined from the beginning of the Gulf War in August of 1990 until a few months after Saddam’s invasion of Kuwait. The volumes were scanned with the purpose to localize debates and themes surrounding the controversial presence of US troops in Saudi Arabia. The actual course of the Gulf War, its issues ranging from a tactical nature to American motives of involvement are irrelevant in this analysis. Relevant here is the reporting of the Gulf crisis, the surrounding issues and how certain events such as the presence of US troops on Saudi soil or the Iraqi invasion of Kuwait were portrayed and contextualized. This can then be compared to supposedly more radical voices such as Bin Ladin’s in order to differentiate the expressed viewpoints. Does the evidence suggest that the Gulf War and the American participation in it gave way to a form of anti-Americanism where the United States is singled out as the aggressor and enemy of the region? Are the grievances solely directed against the United States, its policies and/or its culture? Or is the evidence more diverse and reveals other radical sentiments that are expressed as well, for instance a hatred of the West in general, Jews, Christians, foreigners, etc.? One can possibly recognize pro-American voices among the dissidents as well. Perhaps there is evidence that a liberal movement in Saudi Arabia welcomed the American presence in their country and was hopeful that the Americans might help bring reforms to Saudi Arabia. Another aspect of anti-Americanism is what the grievances are aimed at in particular. Is the anti-American antagonism directed against US policies or US culture, society and values? This is where the American sources are interesting because one can compare the self-evaluation by American officials in form of the US Senate Foreign Relations Committee and their analysis of anti-Americanism with the Arabic/Islamic dissidents and their proclamations. What is very insightful here is the self-perception of the United States and the accuracy of its assessment on what it is that Arab/Islamic extremists hate about America. There seems to be no universal academic definition of anti-Americanism. It has become a popular buzz word with multiple meanings and different variations. Utilizing the term for any analysis opens up a path of seemingly inevitable dichotomy: anti- vs. pro-Americanism. For authors such as Herbert Spiro anti-Americanism is “harsh criticism of the core values of the U.S. constitution.” The corresponding opposite then would be Americanism which has been defined by some as “the acceptance of American values or the pursuit of the American Constitution’s values (freedom, equality, justice, and democracy).” Other scholars have called anti-Americanism a “non-rational position” which is based on pure emotion and lack of reasoning. 1) “Issue-oriented” anti-Americanism, a pattern of outbursts directed against the policies of the U.S. government with which a Third World country disagrees. 2) “Ideological” anti-Americanism, involving a more or less coherent set of ideas, frequently related to nationalism, Marxism, or Islamic fundamentalism, that see the United States as the central villain in the world today. 3) “Instrumental” anti-Americanism, the manipulation of hostility by a government for ulterior purposes, such as mobilizing domestic support or identifying a plausible scapegoat for governmental failure. 4) “Revolutionary” anti-Americanism, which arises in opposition groups seeking to overthrow a pro-U.S. government and develops as an important ideological tenet of the new regime building mass support. Generally, this segmentation of anti-Americanism makes sense and is to a degree helpful. I would still propose two limitations. The first is concerning Rubinstein’s and Smith’s “issue oriented” category which is defined in a way that it becomes almost impossible not to be anti-American. Simply disagreeing with a particular US policy does not deserve the label of anti-Americanism but rather constitutes a critical observer of American politics. In order to fall under the category of “issue oriented” anti-Americanism one would have to systematically reject the policies of the United States with little or no exception. Sigrid Faath and Hanspeter Mattes point out that it is absolutely crucial to differentiate between criticism of America and anti-Americanism. Criticism of America is regarded by Faath and Mattes as “an expression of non-agreement or rejection of political, economic, or cultural measures by the U.S. administration. It is limited to specific aspects, and is policy-and issue-oriented.” They continue arguing that criticism of America “differentiates between the United States as a political player, the country, and its citizens. Anti-Americanism can be reserved for a person’s or group’s position on political, economic, and cultural aspects, going beyond specific criticism of the U.S. administration.” This position reflects my already mentioned reservation regarding Rubinstein’s and Smith’s first category and their inclusion of “issue oriented” criticism in the definition of anti-Americanism. My second objection involves the categories of “instrumental” and “revolutionary” anti-Americanism. Although there is no doubt that these phenomena exist and are well spread throughout the Arab world I do not consider them evidence of genuine anti-Americanism. Usually, anti-American rhetoric and action are predominantly present in these cases which inevitably move them into close proximity of anti-Americanism. But they serve as mere propaganda tools to achieve goals which have nothing to do with the United States or the contents of their anti-American rhetoric or action. A similar example would be regarding all those who claim to believe in Jesus as Christians. This kind of hypocritical behavior distorts the empirical data as no truly felt objection of the United States is present in these cases. After all, if the object of the analysis of anti-Americanism is to gather an understanding of why America is opposed in the Arab world then the exploitation thereof should not be regarded as evidence of anti-Americanism but rather as evidence of the need to investigate the recipients of anti-American rhetoric. Since it is impossible to provide evidence of hypocrisy for all the various groups in the Arab region, category three and four of Rubinstein’s and Smith’s definition cannot be disregarded entirely. 1) Attitudes: Individuals and sections of elites feel resentment, anger, ill will, and hatred toward the government and/or the people of the United States. These attitudes can be deeply felt but remain unexpressed. 2) Verbal Expressions: Speeches, writings, radio and television programs criticize, ridicule or denounce the U.S. government and people. 3) Demonstrations: Large groups of people, more or less organized, assemble publicly to denounce the United States through marches, speeches, and the shouting of slogans. 4) Violence: Violent mob attacks on U.S. embassies, consulates, and U.S.I.A. libraries, and the taking of U.S. government personnel as hostages may be carried out in front of television cameras. More typically, terrorist forms of violence, such as the bombing of embassy buildings or assassination of U.S. officials, are carried out clandestinely with the anti-American message conveyed by the deed itself. They conclude their typology by reiterating that any of these four manifestations falls under one or more categories of anti-Americanism. It is irrelevant whether individuals or groups merely have anti-American attitudes which remain implicit or whether they are part of massive demonstrations or even violent activities. I would consent to the assessment that the severity of anti-Americanism does not matter. Notwithstanding, more importantly is detecting whether or not the specific manifestation is evidence of genuine anti-Americanism or maybe a testament to some other form of objection. As long as a systematic and genuine rejection of American policies or American culture is present its character and blatancy remains subordinate. According to the reflections above, this book includes the following definition of anti-Americanism with which the Arabic and American sources will be analyzed. Anti-Americanism is a methodical, systematic and genuine rejection of policies and/or culture uniquely attributed to the United States in any shape, way or form. This definition is supposed to exclude all forms of exploitation and manipulation of anti-Americanism and also prevent the intermingling of criticism of America with anti-Americanism. At the same time, the definition should distinguish between true anti-American sentiments and broader concepts of rejection such as the damnation of Western culture or foreigners etc. in general. There is a potential problem attempting to separate anti-Americanism from anti-Western attitudes because the United States is oftentimes perceived as the leader of the Western world or even equated with the West. But it is nevertheless possible to point out areas of confusion and misinterpretation. This is not to say that there are no instances of an objection to America and the West at the same time. It merely has to be pointed out that a danger exists of mixing the two together without further investigation. The phenomenon of anti-Americanism is very old and has produced a wealth of material ever since the idea of the New World spread in Europe. Many centuries passed and the characteristics of anti-Americanism have evolved. Yet, the debate remains and the fundamentals seem to have stayed the same as well. All views on anti-Americanism can roughly be placed in one of two categories. America is either criticized for what it stands for as a society, culture, religion, people and its values or it is not liked for what it does politically in the world. Of course, one can only determine which category a particular kind of criticism belongs to only after one knows the definition of anti-Americanism that was used in the specific case. Often times the difference between valid, justified criticism of a particular US policy and a genuine anti-American position becomes blurry. This is the most difficult obstacle in determining the true character of critique directed at the United States. The nature of anti-Americanism also changes depending on the region that is analyzed. For instance the grievances issued by Europeans are a lot different in character than the ones heard in the Middle East, although the categories still apply. What changes might be the tone and grievance itself that may have been voiced. Sometimes though, tone and character of grievance makes all the difference in order to determine whether or not this is an example of mere criticism or actual anti-American sentiment. This book will only pay attention to foreign sources of anti-Americanism and leave out domestic criticism of the United States because the focus is on Arab/Islamic anti-Americanism. It should be noted though that the phenomenon of anti-Americanism is not limited to other countries but is present inside the United States as well. As far as other countries are concerned anti-Americanism has a long tradition in Europe. According to Barry Rubin, Europeans have looked down on American society, culture and its people ever since the idea of America became present in Europe. The images of the Western cowboy without manners, the simple man without knowledge of the outside world, the cultureless society with its low art and popular mass culture and the strangely religious, almost naive sect-like communities have been persistent in European discourse. This kind of European cultural and societal dislike of America influenced the perception of the United States in the Middle East and its thinkers. But as America was still criticized for its materialistic and (in the eyes of the Islamic world) too secular society, it was also hated for its policies in the region which appeared to be increasingly one-sided favoring Israel. US policies were also perceived as unfair and brutal, only intended to exploit the vast oil resources by all means necessary (military aggression). Instead of promoting democracy in the Arab world America seemed only interested in supporting controversial and repressive regimes loyal to them. The scholarly community has produced a lot of material on the origins and nature of anti-Americanism. I am going to name a few trends and introduce some of the main themes that keep reoccurring in alternate forms. I will concentrate on Islamic or Arab forms of anti-Americanism and its scholars as this is the main object of investigation. Since Rubinstein and Smith were the first to conduct an academic analysis on anti-Americanism in the Third World they are the point of origin of every discourse on anti-Americanism in the Arab/Islamic world. Rubinstein and Smith concluded in their work that anti-Americanism was “in part inevitable” because of the surveyed countries’ feelings of “resentment and suspicion with US unilateral policy and economic activities.” Although they recognized the potential of anti-Americanism in the Third World to be utilized and exploited for other purposes they put their main emphasis on US policy and how it helps to explain the antagonistic sentiments of Third World populations. In Rubinstein’s and Smith’s section on anti-Americanism in the Arab world the author Adeed Dawisha provides a complex overview of the origins of Arab hostility towards the United States. Dawisha redraws the conditions of the emergence of Arab nationalism and its opposition to the European powers, namely Britain and France. He then lays out how a rejection of European powers until World War II turned into hostility toward the United States in the 1950s and 1960s. Dawisha argues that it was mostly US policy that led many Arabs to the conclusion that America was equally self-serving as the European powers which confirmed their suspicion of the West. 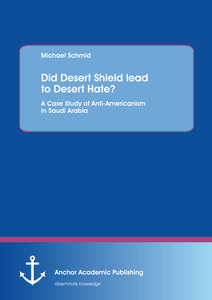 His analysis also explains how Arab nationalism declined over the years and anti-Americanism changed in rhetoric and appearance but not in substance as Islamic fundamentalism emerged. He singles out the US-Israeli relationship and shows how Islamic radicals criticized American policy for being unbalanced and unjust, favoring Israel and disregarding the wishes of the Arab countries. According to the British political scientist Stephen Haseler the United States felt the urge to reinforce its position in the world after overcoming the so-called “Vietnam syndrome.” His analysis from 1986 assessed that America’s increasing insistence on dominance and victory over communism fueled anti-Americanism, especially in developing countries. Again, focus was placed on America’s policies in the world as the source for anti-Americanism. In a 1988 publication Richard Parker, the former US ambassador to Algeria, Morocco, and Lebanon argued that anti-American violence in the Middle East was a reaction to US policy in the region. Parker evaluated US priorities in the Arab world and drew the conclusion that American policy was influenced too greatly by domestic liabilities and the military-industrial complex than by strategic considerations and regional conditions. Bernard Lewis took the discussion one step further in his book The Crisis of Islam. Lewis argues that Muslim anger towards the West and the United States in particular evolved out of disappointments with certain US policies in the region and European anti-American influences and became a deep hatred against everything the United States stands for today. It was not inevitable, as Lewis points out, that many in the Arab world were hopeful and optimistic, viewing the United States as neutral, friendly and even a model for freedom and democracy in the world. The West and Islam were not on an inevitable collision course, but certain key moments in history intensified frustrations with US policies which consequently led to anger and hate towards what America represents. Lewis acknowledges the influence anti-American sentiments coming from Europe and Germany in particular may have had on the Arab anti-American discourse but at the same time he underlines that they probably supported, but were definitely not the origin of the Arab antagonism towards America. The anti-American movement in the Arab world started out against all Western powers interfering in Muslim or Arab countries. It was a resistance against the dependence on foreign powers, against the exploitation of national resources by foreigners, against the local leaders and their brutal regimes. This general mood of independence from any foreign country was soon paired with specific incidents involving the United States. One of the most cited examples when discussing the origins of Arab or Muslim mistrust towards America is the example of Iran in 1953. Although Iran is not an Arab country, this is a case where the United States was welcomed into Iran as a neutral power and benevolent force defending Iran from the Soviet Union. These hopes were crushed by US policies and their involvement in the sacking of the immensely popular leader Muhammad Musaddiq. What began as a mission of hope for so many Iranians ended in their realization that the United States was not interested in spreading freedom and democracy in the world, but only interested in their needs and resources. According to Lewis, the impact of this crisis cannot be overstated as it was the repetition of events such as these that led to the conclusion of many in countries of the Near East that America would do whatever it takes to install its puppet regimes. This conclusion led to hate and condemnation but not for what America did in the region, now it was despised for what it represented. Lewis illustrates this fact with the biography of Sayyid Qutb. Qutb was a key figure in the development of a new kind of hatred towards the United States, according to Lewis. As a member of the Egyptian ministry of education Qutb was sent on a research trip to the United States from 1948-1950. Immediately after his return he became an ideologue of Muslim fundamentalism and an active member of the Muslim Brotherhood. His stay in the United States seemed to have had a profound influence upon his way of thinking. He was appalled by the “American Way of Life” and the profligacy, degeneracy and sexuality. Qutb acknowledged the differences between Eastern spirituality and Western materialism and saw America as an example of the latter. He wrote about America and described how “everything, even religion, is measured through material means.” He came to realize that America was in a state of what he called “jahiliyya.” America was still in this dark era and with its constant interference into the Arab and Muslim society threatened to extinguish the light of Islam. Recent scholars have attempted to give more detailed and diverse account of anti-Americanism in the Arab world. Increased attention is being paid to regional differences of anti-Americanism, its origins and character. Events such as September 11, 2001 contributed to a new and increased interest in the topic. Nevertheless, the bulk of research is still based on the premise that there is a relatively resembling anti-American phenomenon of some sort present in the Middle East. Focus goes into explaining its emergence, either politically or socially. To be fair, some scholars have pointed out the possibility of mixing up anti-Americanism with anti-Western sentiments or simple criticism of a current United States position in a regional matter. Faath and Mattes elaborate on this important distinction. They point out how one first has to differentiate between governmental and social types of criticism. Both kinds are present in the Arab/Islamic world and both do not necessarily mean the presence of anti-Americanism. Even countries with pro-Western orientations have always voiced a certain degree of criticism of America despite good relations. These instances are not evidence of anti-Americanism but sheer difference of opinion which every diplomatic relation will produce from time to time. Another case of misreading criticism for anti-Americanism is the critique of a particular US administration or an unpopular American president. Few presidents were able to remain popular in office without at least some degree of opposition and criticism, especially regarding foreign policy decisions. Brendon O’Connor focuses on the current unpopularity of former President George W. Bush and describes how criticism of the style or policies of the Bush administration are sometimes mistaken for anti-American attitudes. O’Connor pays a lot of attention to the style and portrayal of President Bush and concludes that certain types of criticism on particular presidential decisions, whether justified or not, can easily be seen as anti-American. Arab and Muslim hatred of the United States is not just, or even mainly, a response to actual U.S. policies-policies that, if anything, have been remarkably pro-Arab and pro-Muslim over the years. Rather, such animus is largely the product of self-interested manipulation by various groups within Arab society, groups that use anti-Americanism as a foil to distract public attention from other, far more serious problems within those societies. Rubin acknowledges that the United States, like every other nation, acts according to its national interest. Simultaneously he recognizes that it did not matter what the particular policy involved, Arab and Muslim groups would exploit it to create an anti-American movement of support for their own goals, even if the very policy decision actually favored Muslims or Arabs. Rubin names a few examples where America acted on behalf of Muslim countries but did not receive any credit for it. In his view, America’s intervention in the Gulf War to save Kuwait might have been for other reasons but it was nonetheless pro-Kuwaiti, pro-Muslim and pro-Arab. US involvements in Bosnia and Somalia were other illustrations where America acted on behalf of Muslims in the region and still received heavy criticism for deploying troops there. These events lead Rubin to the conclusion that it is not the United States that should change its course, for it is irrelevant which course of action they choose. Anti-Americanism in the Arab world can only end when the “systems that manufacture and encourage anti-Americanism fail and popular opinion changes.” Disregarding the fact that what Rubin describes would not be considered anti-Americanism here, it is still worthy to note these kind of developments in the Arab world as well. However, most scholars seem to accept the fact that the Arab world is anti-American in one way or another. 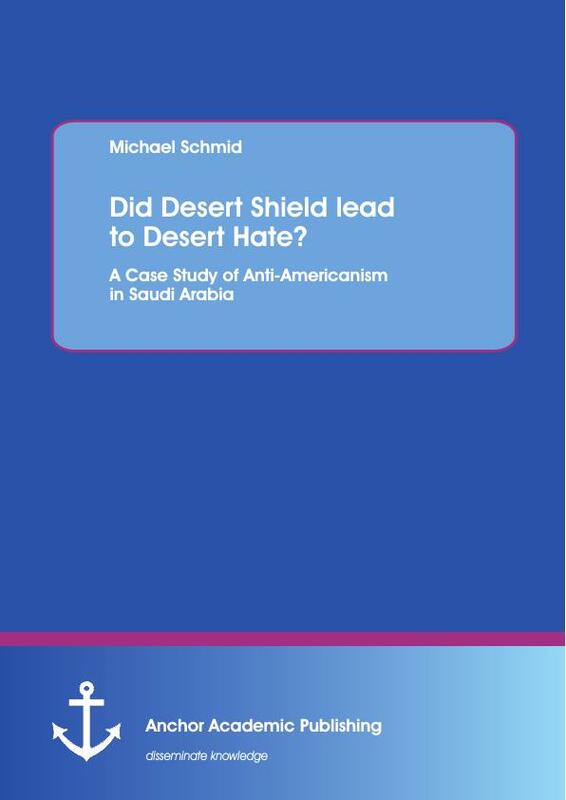 My contribution to the discourse on anti-Americanism, especially in the Arab/Islamic world, is to examine the US presence in Saudi Arabia as an example to reinvestigate this premise. The invasion of Kuwait and the subsequent stationing of American troops in Saudi Arabia are incidents which exemplify the complex and diverse situation within the Arab world and display its internal differences. The question of whether or not one identifies traces of anti-American reactions to US forces inside the kingdom is worth analyzing, as new evidence would reopen the discussion on the seemingly finalized debate on anti-Americanism in the Arab/Islamic world. My approach to the subject of anti-Americanism therefore resembles the works of scholars who attempted to look at the topic from an Arab point of view and not how the United States or the West perceives the Middle East. More effort has been put into using Arabic sources and including various analyses by native scholars. Focusing not just on the superpowers and their effects upon the populations of Third World countries but also on regional actors and leaders is of great importance. Unfortunately, books such as Carl Brown’s work on the elites of Middle Eastern countries have been rare. Brown shows how Middle Eastern elites have manipulated the European powers-France and Britain-for centuries and eventually exploited the United States for their own purposes while America was pursuing its goals. Douglas Little mentions the significance of utilizing foreign language skills and drawing upon new sources in order to better understand America’s involvement in the Middle East and its image there. Little shares his excitement with the prospect of learning a new foreign language and being able to shed light on the diplomatic relations between the United States and the Arab world by the ability to access memoirs, diaries, and declassified documents that have been out of reach due to their foreign tongue. By including Arabic sources in the analysis, this research is intended to be a small contribution on the way to a better understanding of the relationship between the Arab/Islamic world and the United States. 1. Conflict comes from the nature of the two religions and the civilizations based on them: The Muslim concept of Islam as a way of life, transcending and uniting religion and politics versus the Western Christian religion concept of the separate realms of God and Caesar. 2. Conflict is also stemmed from the similarities of both religions: they are both monotheistic and see the world in dualistic us-and-them terms. Both are universalistic, claiming to be the one true faith to which all humans can adhere, and both are missionary religions believing that their adherents have an obligation to convert nonbelievers to that one true faith. The parallel concepts of ‘jihad’ and ‘crusade’ not only resemble each other distinguish these two faiths from other major world religions. It is evident that Huntington identified a systematic existential problem between West and East. It is not the policies of the United States or any Western nation but a problem of “civilizational” differences that explain anti-Americanism and anti-Western attitudes. Though religion certainly is one of his main points in his argument, the reasons for an inevitable collision course run far deeper. Ever since the collapse of the Soviet Union and communism removed this other superpower and potential enemy from the map, the United States loomed over the Arab world as this now unchecked power, waiting to cause havoc in the Middle East. The increased presence of military personnel in the region certainly seemed to confirm Arab worries the United States was finally free to conquer whatever it desired. Rising contacts between Arabs and Americans either in person or through some mediated form proved the danger that America and its culture was posing for the Arab world. Therefore, “in the 1980s and 1990s the overall trend in Islam has been in an anti-Western direction. In part, this is the natural consequence of the Islamic Resurgence and the reaction against the perceived ‘gharbzadegi’ or Westoxication of Muslim societies.” By reaffirming Islam, Muslims repudiate European or American influence upon local politics, society and morals. Muslims view Western societies and morals as a threat to their own. The power the West has to spread its values and ideals is feared and resented by Muslims because they worry an interference into their own society will lead to the “Westoxication” of it. Western culture is seen as materialistic, decadent, immoral and corrupt. Therefore any intrusion into the Muslim society would contaminate it and rid it of its purity. American society in particular is not viewed as very religious by Muslims. They see it as a secular society, something that is considerably more despised than a truly Christian society. The evils of immorality, secularism and irreligiosity are thus worse evils than Western Christianity. Huntington interprets the Gulf War of 1990 (in addition to the Afghan War of 1979-1989) as the first “civilizational” war where East was battling the West. It is “civilizational” in his opinion because it is a clash between Islam and the West. The very foundations of the two civilizations create conditions of inevitable conflict. The Gulf War of 1990 became the first example of that because the West intervened in a Muslim conflict where the Western nations almost unanimously supported the intervention while the Muslim countries came to see the interference as a war against Islam and an example of Western imperialism. It has to be underlined that the clash of civilizations concept and the resulting anti-Western attitudes do in no way equal anti-American sentiments. To the contrary, Huntington’s premise is based upon much broader attitudes of belligerence as noted above. The only point of convergence could be the perception of America as the leader of the Western world, where antagonism towards the West could translate into hatred towards the United States due to its character and importance to the Western world. Being anti-Western is often equaled with being anti-American which leads to the false conclusion that grievances voiced against the Western world are essentially directed at America. Although the clash of civilizations theme is not synonymous for anti-Americanism it is still relevant for this analysis. It is precisely due to this misunderstanding that the analysis of anti-Americanism in Saudi Arabia is important. If there is evidence that suggests a similar kind of confusion with the two attitudes then this analysis can provide tools of clarification through its direct application and comparison of a definition of anti-Americanism with specific grievances of a region. The relationship between the United States and the Arab/Islamic countries cannot be fully understood without contextualizing them into the period of Western colonial rule in the region. The experiences of that pivotal time shaped many of the opinions and sentiments the Arab Muslim population has not only of the Western powers involved, but also of the United States. It is important to discuss the early twentieth century in the region because it marks the beginnings of certain attitudes and perceptions towards contemporary Western nations. Especially crucial in this context is the issue of the future of Palestine which became a symbol of Arab powerlessness (Ohnmacht) in the face of Western imperialism to the present day. From the death of the Prophet Muhammad in AD 632 until the installation of the Ottoman Empire in 1517 the Islamic Caliphate had been ruled by Arab Muslim successors, so called Caliphs. The Turkish rule of the Arab Islamic region lasted for centuries until Mustafa Kemal Ataturk established the Republic of Turkey in 1924. Relevant here is the period before the Ottoman Empire dissolved into many nation states. In 1914, the Ottoman Empire signed a treaty with Germany which led to its entering World War I against Russia and also the United Kingdom. Driven by the traditional Ottoman fear of the Russian Empire, the Ottomans decided to enter into the alliance with Germany which ultimately brought down the empire that had ruled the Orient for such a long time. A closer look at the developments of 1916 and 1917 reveals how forces within and outside of the Ottoman Empire were planning to terminate the Ottoman ruling of the region. Ottoman dominance of the region, though based on Islamic legitimacy, was scrutinized increasingly in many Arab parts of the empire because it was seen as a largely non-Arab kingdom. At approximately the same time, a second agreement was fostered, this time between the British and the French. The Sykes-Picot Agreement of 1916, named after the British diplomat Mark Sykes and the French diplomat François G. Picot, did not echo any of the words of the previous deal of Arab independence and effectively divided the Arab world into British and French colonial territories. It was the publication of the latter agreement which sparked a lot of anger at Britain and France. This led to a complete misrepresentation of the following events. The revolution that was promised by Sharif Hussein began, only to be crushed by the Ottomans since Hussein’s army was by no means as strong as he had suggested to the British. The defeat of his army forced the British forces to step in and finish the revolution for him. Afterwards, Sharif Hussein declared himself King of Arabia and expected to rule one unified Arab country. In fact, the opposite happened. Sharif Hussein only reigned over parts of Hijaz, which was a Western part of present day Saudi Arabia. Greater Syria and Iraq became British and French colonial territories and Saudi Arabia soon would become autonomous under the ruling of the Al-Saud family in 1924. This episode of Arab history is full of misunderstandings and misinterpretations which are responsible for the ever present awareness of the conspiracy (al Mu’amarah ) by Western powers. Quite a few dissident groups in the Arab world draw on this particular example of a plot by the Western imperialists to divide and conquer the Arab region. In their view, the Sykes-Picot Agreement shows the real face of the West and how Western powers cannot be trusted regardless of what they say. All the West cares about is economic interests and territorial expansion. Even though all the evidence suggests that, if anything, the Arab revolt was a dual British-Arabic fraud, this so-called conspiracy has strong resonance among contemporary dissidents and anti-American voices. The recriminatory character of the Mu’amarah concept gives explanatory meaning to the misery and poverty of the masses in the Arab communities. Placing the blame on foreign imperialism and exploitation was and is more attractive to many of the disadvantaged and their rulers than a close examination of the mistakes and actions committed by locals. Sharif Hussein played a double game, receiving support from the British for his fight against the Turks while at the same time receiving support from the Turks for his fight against the British. To Hussein, getting the long-desired power and influence over the Arab world was more important than being the noble leader the word sharif implies or what the Arab dissidents made him in retrospect. On the other hand, the British clearly were less interested in Arab independence than in conquering more territories. At the same time, Britain remained intentionally vague when they formulated their initial pledge to honor Arab independence. They had a different idea of what was considered the Arab world than Sharif Hussein. Additionally, their agreement never led to an official and legally binding agreement which makes the whole situation look less like a conspiracy and more like a game of deception on both sides. Since the phenomenon of the Mu’amarah will be discussed more thoroughly later on, focus now will be on the two important trains of thought in the Arab world: Pan- Arabism and Pan-Islamism. In the Arab/Islamic world political activists and opinions generally either adhere to the concept of Islamism or Arabism. Undoubtedly, there are also scores of Muslims or Arabs who support neither concept and are too preoccupied with their personal problems and daily lives. However, those who choose to engage in the process of Arab/Muslim identity and its relationship with the outside world inevitably come across one of the two themes. Before discussing the concept of Pan-Arabism and Pan-Islamism any further it has to be noted that a quite significant problem exists regarding the labeling of Arabic or Islamic movements. This problem might be due to language barriers or lack of knowledge but it is crucial to have an understanding of what is referred to by titling a phenomenon Islamist or fundamentalist. First of all, it is imperative to point out that none of the following terms are in any way synonymous for the religion of Islam. According to the Encyclopedia of Islam, Islam is the “‘surrender to God’ (an inner action) and ‘profession of Islām,’ that is to say adherence to the message of the Prophet.” All the movements that politicize Islam in whichever way are based upon particular viewpoints and interpretations of Islam and therefore have to be regarded with the utmost scrutiny. Secondly, terms such as Islamist, Islamism, and Islamic have increasingly been stigmatized and associated with extreme negativity. Oftentimes, combined words such as Islamic terrorism, Islamic extremism, militant Islamist or Islamic fundamentalist are used in the discourse about Islam and the West. The desperate search for words and ways to describe this recent phenomenon that features violent attacks in the name of one specific religion is part of the reason that such an abundance of definitions and names erupted. It remains essential to bear in mind the original and sole translation of the words Islamic and Islamist, which is completely impartial. Someone who commits him/herself to the “study of Islam” is called Islamic (islami, islamiya) but someone who is a devout believer in the religion of Islam is called Muslim. Even the term Islamist used to be neutral until recently in the Arabic language. Nowadays, calling a group of people Islamists (Islamiyun or Islamawiyyun) has come to mean something sinister. This analysis uses the term “Islamic anti-Americanism” only due to the necessity of including Muslim Arab countries into the research of anti-Americanism in the region. However, it is not my intention to suggest that anti-Americanism or whatever phenomenon identified here is inherently Islamic. Although Islamic revivalist and fundamentalist movements appear very wide spread and strong in today’s Arab region, this is a fairly new trend. The concept of Pan-Arabism is far older and deeply rooted in Arab history. According to Bassam Tibi, the beginnings of Pan- Arabism date back to the second half of the nineteenth century where the Arab world picked up Europe’s theme of national identity. After World War II a sense of an Arab identity and Arab nationalism developed. Many nations sought independence and sovereignty from their former occupiers. The withdrawal of Britain and France as the traditional colonial powers led to increasing popularity of the idea of an Arab identity. Feelings of unjust behavior by the colonial Empires mixed with the already mentioned sense of betrayal and conspiracy (al Mu’amarah) brought forth an atmosphere of revolution and secular national pride. Especially Egypt and Syria became the leaders of a movement that began as Arab nationalism but soon transformed into something larger, incorporating the idea of a single unified Arab country under one banner. Advocates of this idea saw the territorial boundaries as unjust, illegal and arbitrarily placed by the colonial powers of the West. In order to restore justice in the Arab world, the chopped up region had to unite and form one great Arab nation from Morocco to the Oman. Only a strong and unified Arab power stood a chance to preserve Arab identity, subdue Western influences and uphold an opportunity to counter Western superiority over the region. The second picture represents a commentary on Pan-Arabism and the reasons for its nonexistence. It shows the threats to Arab unity and who bears responsibility for the Arabs not being capable of achieving their goal. It reveals the perception of Pan-Arabists that the United States is successfully dividing the Arabs, potentially because a unified Arab kingdom is perceived as too powerful by the United States. Furthermore, a strong unified Arab country would cease to be territory of economic exploitation for the United States, which would be disadvantageous for America. On top of that, the caricature nicely emphasizes the concept of the Mu’amarah (see section 4.5) which alludes to a Western conspiracy working against the Arab’s plan to unite. We see a sword resembling that of the Prophet Muhammad with the word US on it cutting in half an Arab representing Arab unity. The words “Arab unity” are written in bloody Arabic letters with black drips of oil coming from the sword and letters. Otmane Lihiya, Hocharabisch: Aussprache und Hörverständnis, Band II. (Berlin: micmobil.de, 2005), 9. The term Arab/Islamic world refers to Muslim countries in the Arab region. It does not include every country with Muslim majorities. The focus is on Arab-speaking countries, namely Saudi Arabia, Iraq, Jordan, and Egypt as players in the Gulf War of 1990/1991. القاعدة [ al Qaida ]: Originally stems from the verb sitting. The noun can mean foundation, basis, grounding and scientific rule. Interestingly, the word al Qaida is used in a military sense in Arabic countries as a way to refer to a military base, see Hans Wehr, Arabisches Woerterbuch Fuer Die Schriftsprache Der Gegenwart: Arabisch-Deutsch, (Wiesbaden: O. Harrassowitz, 1985), 1045. فتوى [ Fatwa ]: An opinion on a point of law, the term “law” applying, in Islam, to all civil or religious matters, see P.J. Bearman, ed., Encyclopedia of Islam (Leiden: Brill, 2007), Volume II, 866. Bin Ladin issued multiple fatwas calling upon Muslims to take up arms against the United States but is neither authorized nor qualified to declare fatwas as he has not undergone any religious training or formal practice of Islamic law. “Statement Urging Jihad Against Americans,” The statement was issued and signed by the “World Islamic Front,” (consisting of الشيخ أسامة بن محمد بن لادن [Al-Shaykh Usama Bin- Muhammad Bin Ladin]; أيمن الزواهري [Ayman al-Zawahiri], emir of the Jihad Group in Egypt; أبو ياسر رفاعي أحمد طه [Abu-Yasir Rifa'i Ahmad Taha], a leader of the [Egyptian] Islamic Group; الشيخ مير حمزة [Al-Shaykh Mir Hamzah], secretary of the Jamiat-ul-Ulema-e-Pakistan; and فضل الرحمان [Fazlul al-Rahman], emir of the Jihad Movement in Bangladesh), see القدس العربي [ al-Quds al-ʻ Arabī ] (February 23, 1998): 3. It is noteworthy that no other public figure is referred to in the first name in the Western press except Saddam Hussein. During the research for this book, newspaper articles that discussed the Gulf War constantly called him Saddam, while the Arabic press always printed the full name. Jason Burke, Al-Qaeda: Casting a Shadow of Terror (New York: I.B. Tauris, 2003), 179. Rohan Gunaratna, Inside Al Qaeda: Global Network of Terror (New York: Columbia University Press, 2002), 37. خادم الحرمين الشريفين [ Khadim al-Haramayn al-Sharifayn ]. This expression literally means “servant of the holy sites” and not guardian. In the Arabic language it is one of the most important titles in all of Islam, see P.J. Bearman, ed., Encyclopedia of Islam (Leiden: Brill, 2007), Volume IV, 899. The term “Islamic principles” refers to principles in accordance with the Wahhabi interpretation of Islam, which in this case alludes to the exemption of other religions in Saudi Arabia except Islam. Gunaratna, Inside Al Qaeda, 62. For more information on Bin Ladin’s radicalization or Al Qaida in general, see Jason Burke: Al Qaida-Wurzeln, Geschichte, Organisation. Düsseldorf: Artemis & Winkler, 2004. Herbert Spiro, “Anti-Americanism in Western Europe,” in The Annals of the American Academy of Political and Social Science (Newsbury Park: Sage Publications, 1988), 120. Sigrid Faath, “The Problematic Topic of Anti-Americanism,” in Anti-Americanism in the Islamic World (London: Hurst & Co., 2006), 7. With regard to Germany, Gesine Schwan defined pro-Americanism as “an affirmation of American freedom.” See Gesine Schwan, “Antikommunismus und Antiamerikanismus. Deutsches Bewusstsein nach 1945,” in Blätter für deutsche Geschichte und internationale Politik (Bonn: Blätterverlagsgesellschaft, 1999), 77-88. André Kaspi, “By Way of Conclusion,” in The Rise and Fall of Anti-Americanism: A Century of French Perception (New York: St. Martin's Press, 1990), 237. Alvin Rubinstein, Anti-Americanism in the Third World: Implications for U.S. Foreign Policy (New York: Praeger, 1985). Alvin Rubinstein, “Anti-Americanism in the Third World,” Orbis 28 (1984): 594. Alvin Rubinstein, “Anti-Americanism: Anatomy of a Phenomenon,” in Anti-Americanism in the Third World: Implications for U.S. Foreign Policy (New York: Praeger, 1985), 21-28. Sigrid Faath and Hanspeter Mattes, “Between Anti-Americanism, Criticism of America and Americanism,” in Anti-Americanism in the Islamic World (London: Hurst, 2006), 221. Rubinstein, “Anti-Americanism in the Third World,” 19. Barry Rubin, Hating America: A History (New York: Oxford University Press, 2004). For more information on domestic anti-Americanism see Paul Hollander, Understanding Anti-Americanism: Its Origins and Impact at Home and Abroad (Chicago: Ivan R. Dee, 2004). Alvin Rubinstein and Donald Smith, “Anti-Americanism in the Third World,” Annals of the American Academy of Political and Social Science. 497 (May 1988): 43-44. Adeed Dawisha, “Anti-Americanism in the Arab World: Memories of the Past in the Attitudes of the Present,” in Anti-Americanism in the Third World: Implications for U.S. Foreign Policy (New York: Praeger, 1985), 75-82; The article by Ussama Makdisi published shortly after the 9/11 attacks basically picks up Rubinstein’s and Dawisha’s theme and lays out how Arabs feel mistreated by US policy. Although it began as an objection towards US values and culture, anti-Americanism for Makdisi is no “civilizational” issue but a policy problem on the part of the United States. For more on this point, see Ussama Makdisi, “Anti-Americanism in the Arab World: An Interpretation of a Brief History,” The Journal of American History. 89 (September 2002): 538-557. For more information on the “Vietnam syndrome,” see Derek Buckaloo, Fighting the Last War: The "Vietnam Syndrome" as a Constraint on U.S. Foreign Policy, 1975-1991 (Ann Arbor: ProQuest, 2002); Geoffrey Simons, Vietnam Syndrome: Impact on US Foreign Policy (New York: St. Martin's Press, 1998). Stephen Haseler, Anti-Americanism: Steps on a Dangerous Path (London: Alliance Publishers for the Institute for European Defence & Strategic Studies, 1986). Richard Parker, “Anti-Americanism in the Arab World,” Annals of the American Academy of Political and Social Science. 497 (May 1988): 56-57. Bernard Lewis, The Crisis of Islam: Holy War and Unholy Terror (New York: Modern Library, 2003), 83-84. Lewis provides examples such as Rainer Maria Rilke, Oswald Spengler, Ernst Jünger “attacking America for its cultureless society, rich, spoiled and materially advanced but without soul, and artificial, not naturally grown, but artificially constructed,” see Lewis, 87/88. السيد قطب [Sayyid Qutb], “أمريكا التي رأيت [Amrika allati ra'aytu] [The America I have seen],” الرسالة [ al Risalah ] 19, no. 961 (June 1978): 1360. الجاهلية [ al-jahiliyya ] comes from the verb جهل [ja-ha-la] which means to be ignorant and in this case refers to the age of ignorance, a time period before the Prophet spread the word about Islam. Faath and Mattes, “Between Anti-Americanism, Criticism of America and Americanism,” 224-225. Brendon O'Connor, “George W. Bush and Anti-Americanism,” in Anti-Americanism: History, Causes, and Themes, vol. 4 (Westport: Greenwood World Pub., 2007), 1-19. Barry Rubin, “The Real Roots of Arab Anti-Americanism,” Foreign Affairs 81 (December 2002): 73. Carl Brown, International Politics and the Middle East: Old Rules, Dangerous Game (Princeton: Princeton University Press, 1984). Douglas Little, “Gideon’s Band: America and the Middle East since 1945,” Diplomatic History 18 (Fall 1994): 539. Samuel Huntington, The Clash of Civilizations and the Remaking of World Order (New York: Simon & Schuster, 1996), 210-211. Gharbzadegi is partly Arabic. غرب [ Gharb ] can be translated with “West.” The other part is Persian. Huntington characterizes Islam as a civilization that is based upon its conviction of cultural superiority and its inferiority of its power. Huntington characterizes the West as a civilization which is based upon its belief in the universality of its culture and superior power, making it its duty to spread their culture throughout the world. The Arabic word for Caliph is خليفة and refers to the institution of the caliphate, which was born on the day after the death of the Prophet when the new head of the community, the trusted Companion Abū Bakr, became خليفةرسول‏الله [ k̲h̲alīfat rasūl Allāh ] [successor to the messenger of God] in 11/632. Since the Prophet’s death, the successors of Muhammad were the Caliphs, see Bearman, Encyclopedia of Islam, Volume IV, 937. Kylie Baxter, US Foreign Policy in the Middle East: The Roots of Anti-Americanism (New York: Routledge, 2008), 10. “McMahon-Hussein Correspondence,” 1915, available at www.mideastweb.org/mcmahon.htm (last access: 13.11.2008). Bassam Tibi, Die Verschwörung: Das Trauma Arabischer Politik (Hamburg: Hoffmann und Campe, 1994), 22-23. المؤامرة [ al Mu’amarah ] is the Arabic word for conspiracy. The origin of the English word “sheriff” comes from the Arabic word الشريف[ al-sharif ]. It is translated with “noble”, “exalted”, “eminent” [in religious or worldly esteem], derives from the root s̲h̲-r-f, which expresses the idea of exaltedness and prominence. The broadest specifically Islamic meaning of s̲h̲arīf has been “descendant of the Prophet.” See Bearman, Encyclopedia of Islam, Volume IX, 329. Bearman, Encyclopedia of Islam, Volume IV, 171. Wehr, Arabisches Woerterbuch Fuer Die Schriftsprache Der Gegenwart, 593. Whereas الإسلاميون [ al- Islamiyun ] refers to Islamist groups who engage in the political process and exist as political parties with an extremly religious and conservative platform in countries such as Morocco and Jordan; الإسلامويون [ al- Islamawiyyun ] is the Arabic term for radical Islamist groups such as al Qaida who engage in violence and terrorist activities. Interview with Otmane Lihiya, who is a Linguistic Lecturer in Berlin, conducted on March 10, 2009. Bassam Tibi, Vom Gottesreich Zum Nationalstaat: Islam Und Panarabischer Nationalismus (Frankfurt am Main: Suhrkamp, 1987). P.J. Vatikiotis, “Between Arabism and Islamism,” Middle Eastern Studies 22 (October 1986): 577. Due to various reasons, domestically and externally, Egypt and Syria became perceived as champions of the Arab cause. One major appealing factor was the way Pan-Arabism was linked to social equality and the promise of lifting the poor out of poverty. For more information on that, see Charles Cremeans, The Arabs and the World: Nasser's Arab Nationalist Policy. (New York: Praeger, 1963). Vatikiotis, “Between Arabism and Islamism,” 577. This picture was published by الدستور [ al-Dustūr ], August 10, 1990, 21.